Congrats to YaYa for being the huDge winner! So, my pal Tiffany (of SITS girl fame) and I are each one of Fishful Thinking's Faculty Moms. And, Tiffany's SITS business partner, Miss Heather, is an Ambassador of the program. All three of us feel strongly about the message and LOVE the new Storybook feature. So, we thought we'd get together and have a little giveaway. When we say little, we actually mean big. Like your own bounce house big! You need to find something for your kids to do outside where they won't be driving you totally nuts. 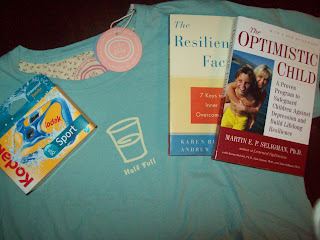 Cleverly disguised as a "Summer Fun Giveaway", it's actually a "Mom Keeps Her Sanity Intact Giveaway". Yes, you see right. It's a bounce house. 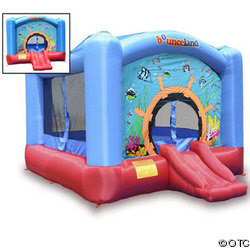 A full sized bounce house shipped to your door! Here is the info: This fun house inflates to 16-ft. x 13-ft. x 9 1/2-ft. Includes powerful commercial 1 horsepower blower with 25-ft. power cord and a 6 1/2-ft. fill-tube so the blower can be placed away from the bouncer — it easily inflates in minutes! Includes large carrying bag, repair kit, instructions and ground stakes for placement. Made of heavy-duty puncture proof vinyl with double-stitched seams with large pillars for extra support. Maximum occupancy of up to five 100-lb. children; ages 3 and up at one time; 500 lb. weight limit. UL listed. We've also included a slip-n-slide, cause what is summer fun without getting wet and wild? Summer wouldn't be fun without some cash, right? $50 Amex gift card is included. All in all we are talking about over $400 in prizes! So, how do you win? 1. First you leave a comment here. 4. Every Storybook you make gets you 5 entries. 5. You must comment here and tell me why you want this package! 6. Every comment you leave on SITS or here in June gets you 1 entry. 7. All Followers get an additional entry. We can't wait to see your Storybooks! Oh, as an added bonus? All those Storybooks also enter you into Fishful Thinking's $10,000 scholarship giveaway! The Fine Print: Contest open to continental US only. Eligible Storybooks must be created after May 29th, 2009 and of appropriate content. You can make as many Storybooks as you'd like. Please note: While Fishful Thinking items were donated by Pepperidge Farm, all other items were donated personally by Tiffany, Sarah and Heather. Coming over from SITS! What an awesome giveaway!! I would love to win this because with 4 kids at home constantly (I homeschool) things get a little "hairy" sometimes...We live out in the middle of nowhere so there are no real parks, swimming pools, etc nearby. We could never afford this on our own but I would love for them to have the bouncy house...generally speaking the only time they see one of those is at a festival or the fair....how cool would it be for them to have one in the backyard? Thank you so much for this opportunity. Oh, I so want this!! Hi, just stopping over from SITS to let you know why I want the package. I will share this package with my daughter who is the mother of my 3 year old granddaughter. Okay, I think I have covered everything. I'm a Follower, created the storybook, left a comment here and at SITS, which i will continue to do. I'm first!! Thats gotta count for something right. Lets see why I want this? Because this "is" my son. Optimistic, happy, fun. You'll see by my storybook. One of Landon's first words were outside. Because he loves it so much and he's the happiest kid in the world when he is outside. We really really want this package. We'll still go on being happy without it but he'd be even happier with it. Oh and he loves goldfish? Lol. Why do I want all the goodies? Because they are wonderful prizes and I can divide them amongst several people. It is rather like the old saying "Killing two birds with one stone." Alyssa can have the SLIP N SLIDE and camera; I can have the chocolate and TShirt; we can put the books in Alyssa's hope chest; the tote bag full of goodies can go to Grandma; and the big bounce house...well, it will be hard to choose who to give it to, but it will make a very nice surprise! We can find a family with children who can not afford to buy such a nice gift for them. That would help enforce all the positives I have been teaching Alyssa through the years. I must have this! My three year old needs something fun to do outside this summer! And since I live in Cali, it's going to be HOT! Love the whole Fishful thinking program. You guys do a great job! I wanna win! Read my storybook and you'll know why! We're trying to adopt a sibling group of 4, this package would be awesome for us!!!! Stopping by from SITSThanks for the generous giveaway you girls are offering. Very Cool! I am following you now too. I had to come tell you why I want this REALLY REALLY badly!!! I am 30 weeks pregnant. I have my child..PLUS the kids I keep during the summer! I also have playgroups and things that come over. This would be FANTASTIC! I'm going to be HUGE, HOT, and I won't have a whole lot of patience with being so pregnant! This will keep the kiddos out of my hair a LITTLE! Thanks sooooo much for this amazing chance! I'll do my story book soon! Because I have three kids and we live in the middle of nowhere. No public pool, no library, no museums. Oh, but we do have a huge backyard. And it's only a week into summer vacay and I'm already pulling my hair out! This giveaway is amazing! Thanks so much for putting it together! My son's birthday is in July and bounce houses are without a doubt his very favorite thing - he would go bonkers over all this! Thank you for doing this giveaway...how fun! Why would I be a good winner...it would definately brighten our day :-) and give us a little hope! I am also a follower! I want to win this for my kids. They have been so good in school, my house and with others. What a beautiful summer gift for them to reward their good behavior. Thanks! I want to win this for my Mom who will be hosting a family reunion this summer! Perfect for all the kids! I want to win this to keep my sanity this summer as this is the first summer of balancing two children - an almost 6 year old girl who loves bounce houses and a baby! So count me in on this contest! This is seriously one of the BEST giveaways I've seen!! I have two sets of twins, 4 yrs old and 2 yrs old....they would absolutely go nuts with the bounce house!!! They have so much energy that by bedtime they are still climbing the walls!!! Okay, true confessions time. I signed up with Fishful Thinking and my bag filled with stuff was just sitting there. For like a month. (I was busy! And yes, I know we're all busy...) Just a few days ago I finally went through it and have been using my notepad, pens, sharing the mini packages of Goldfish....but I admit I have not been spreading the Fishful Thinking word. So THANK YOU. I believe in optimism. I believe creating resilience in our kids is the #1 gift we can give them as we send them out into the world. As for why I really, really (really!) want this prize: where I live it gets blazing hot in the summer. What a sanity saver this package would be. But mainly, we've decided to *simplify* this summer. This is mainly a financial decision but also is a lifestyle choice. Last year was filled with day camps, classes, and other organized activities, and this year, I am trying to be more creative about doing free and very-low-cost activities with my girls over the summer. This package fits in perfectly with my plan. I would LOVE to win this giveaway because...I have six children and our budget is crunched. Looks like a "STAY-cation" this year and well, I'm the stay at home parent and REALLY need a break. With this giveaway I could sit in a lawn chair with an ice cold drink (coca cola is liquid gold! ), reading an adult book (without pictures), while the kiddos bounce, splash, WHATEVER! Peace and tranquilty will surround me. Winning this AWESOME giveaway would give me an ENTIRE Summer to just indulge myself...I could sew, I could garden, I can do whatever I want because the kiddos will be bouncing, splashing and having a blast!!! I would LOVE this summer fun package because come summer time, I have 5 kids in my 3 bedroom townhouse 24/7 and it gets crowded!! I need something fun that I can send them outside to do! Thank YOU and the SITS Girls for doing this!!! Making the storybook was alot of fun this morning!! I think my Bella should win because she actually had a beautiful bouncey tent but the movers destroyed it when we moved last August. It really broke her heart and the price tag wasn't something we could spring for again (soldiers don't make alot of money, lol!!). Thanks again for this opportunity!! You can see my book on my blog and on the SITS Mr. Linky! I would love to win this because I have two step sons a toddler and a 7 month old. They are all boys and they have so much energy!! 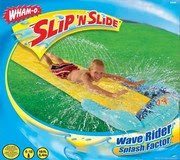 This would give them hours of fun and a chance to burn off a little of that overflowing energy. Why WOULDN'T I want to win this!!! I have twin TWO year olds and they are currently winning the battle for mommy's sanity! In all honesty this age is an absoute blast but there are those days when we could all use a little diversion. Great giveaway! Thanks for sharing it with us!!! I am a fellow fishful thinking ambassador too! I was thinking I'd tell you that I'd like to win this prize cause it would drive my husband crazy to have his grass wrecked by a huge bounce house and a slip and slide, but that would be kinda mean. So I'll go with, "Because it will bring happiness and smiles to all the children of my neighbor. But mostly to MY kids." Thank you for offering all the goodies! What a wonderful giveaway! While I would like to say that I want this giveaway because my son and daughter would pee their pants at the sight of a bounce house, I cant. I want to bounce in the darn thing! And a Slip and Slide! I havent been on one in years! I want fun! I want fun! Holy cow! Who wouldn't want to win this awesome prize! I'm also a fellow ambassador for Fishful Thinking and I really do believe in it:0)the Storybook feature is amazing! I love this giveaway and making the storybook was so fun! Can we print them out somehow? I didn't see a way to do that. Anyway, I have two boys and lots of neighborhood kids who would LOVE this bounce house! I also love the idea of a slip n' slide. I didn't even realize they still made those. I think they came out when I was a kid! All in all, the kids around here would really appreciate a fun new toy! I would love to win a blog contest. Period. This one is over the top and would be a pretty awesome prize for my family and I!! I'm a follower here and at SITS! WOW! Such an awesome price pack! I'd love to win so that I can have something fun for my kids to do this summer! Okay...made my book, oh what fun! Thanks for the chance to win...this is great! With the yard finally being in some shape for the kids to have a space to play, I'd love to be able to have a big exciting summer fun area for them. I have three boys who refuse to attend camps in the summer. They want to be with me and each other and I have to say - I want to be with them, too. This would make our home a camp experience and let us play together during the short summer we have each other. Though I would love to win this prize, I have to say that making my book was almost reward enough. I really thought about something important I wanted to share and smiled and cried as I pieced it together. Thank you for that. I am in desperate need of outdoor physical activities for my two year old twins! What could be better than a bouncie house, a slip and slide??? This would be an answered prayer if I won! I would LOVE this for my kids!! They are feeling low because our neighbor has a pool and we don't - these goodies would even trump the pool, I think :) How generous of you! Thank you! Side note - congrats on being a faculty mom!! I'm an ambassador and didn't know there WAS such a thing as a faculty mom. I'd love to know more! All my kiddos are all grown up now but I'm telling my sister about this. Her children are 11 and under and would loooove these prizes. Noticed that others told you that they are now followers...me too! This is the craziest giveaway ever! I just did my story and linked it on SITS. Im following this blog... what a great giveaway! She starts school this Fall and I really want to make this a summer to remember for her (and her sister). stopping by from SITS! What a fantabulous giveaway! I have been wanting to get my girls a bounce house for 2 years now. We have an enormous backyard and with E's b-day in July it would be a great gift for her! I'm headed back to my site to blog about this...Hmmm maybe I shouldnt lol then more people will enter. I'm stopping by to share that I am the poster child for optimism..."I LOVE winning prizes! ", "This new bouncehouse is going to look great in my yard!" My storybook is in honor of my brave and empowered Daisy Girl Scouts! We would love to have a BIG PARTY for them with bouncing and sliding! Robin, LOVE, love, LOVE the Storybook dedicated to your Girl Scouts. What a testiment to what amazing people they are and the good they are bringing to their community! It's been a long day and I'm just stopping to say, "Hi!" I would love to win this package for my Reilly. She cannot go in normal bouncy houses, becuase of germ sharing issues. You see, she has Cystic Fibrosis and one bad germ can destroy her health. I would love to have this in our yard for her to play on, and the slip and slide would be perfect, too! Of course, I love the mommy goodies that come with it, too! Still having trouble linking up my storybook, but it is finished. Thanks for having this giveaway! What can I say, you & SITS are AWESOME! I would love to win this because my kids don't have any outdoor fun toys like swingsets or pools. My husband has been out of work for a year and we have an 8 month old in addition to the two older ones and its just been really hard for them. We had to move into my husband's parent's house because we had nowhere to go. I would just like to be able to have something for my kids! I SOOOOO want to win this!! Can I post a comment everyday? Can I put a link to your blog on my blog and get an extra entry? Can I read all the directions that were properly written above instead of haselling you? Maybe. I LOVE Healing Touch's comment! Fishful Thinking rocks our world! Wow! What a great giveaway! I am a stay at home mom of three kids and we hvae recently moved to a new house. We are still getting to know people in the area and this would be a great way to meet some kids my kids age. I also love the storybook idea. My kids and I are working on ours and having a great time! This giveaway is TOO GOOD TO BE TRUE! Thank you! love this bounce house too cute my children would luv it. (how are you counting entry's? certain post? Ok, anyone who knows me, knows that this giveaway was created with ME in mind, 6 little ones, 1 mama who is teetering on the edge of insanity, summer months, very few kid-free moments.....all of this spells disaster, unless I win the giveaway, so who do I need to email to win this? Stopping by from SITS to say hello and tell you how much I would love to win this bounce house and the rest of the package. I have 5 kids here for the summer and they would think I was the best mom and grandma ever if I won this for them to playin. What a great giveaway!! just stopping through trying to rack up on entries for the bounce house that has my name on it!! Another day in June...checking in...send bouncehouse! Bouncing in for another bouncehouse entry! Still thinkin' this is an awesome giveaway. Love the Fishful Thinking Storybook Maker! One of the challenges of being a stay at home mom, rather than having a child at daycare is- lack of cool toys! Boy oh boy!!! This giveaway would make our house the coolest on the block, and give mommy a few extra moments of sanity! Best giveaway EVER!!! EVER I tell you!!! Thanks so much for the entry! I found you all from the SITS site - I would love to have this prize to help entertain my children. I have a 2 yr old as well as 2 teenagers. These fantastic summer toys are something all three could enjoy together. The older ones are so good with their little brother, but finding things to do that are fun for all can be challenging. This would be perfect! *smile* We don't have many outdoor toys for our youngest son, as we despaired of having more children and gave away all of the baby/toddler toys. Oh my ... just imagining the fun that could be had at our house this summer! I made my book ... I LOVE that feature and plan on making a couple more. Are they printable? I am following you now and will be blogging about the giveaway this afternoon. Why do I want to win? Because I have a very long summer with my 3 and 4 year old crazed sons! We have no school, no daycamps, no vacations, no classes. Nothing but long summer days to fill... And I'm terrified! I would love to win this because it will allow my 10 year old son to play with his sisters and brothers.Most know we are at the end of the process of adopting four children and we have 2 biological children. Our son Dallas is blind in both eyes has Cp and is autistic. Dallas is limited in what he can do with his sisters and brothers. one thing he loves to do is jump! This would be perfect as everyone could enjoy the fun house as a family together. We have movie night every weekend and Dallas is unable to enjoy the movies with us . The other 5 children are all in sports and he is unable to join a sport hiimself he goes to every game and sits like a big boy telling them good job! He has came so far in his little life being 1 pound 10 oz at one point today we are very greatful for our sunshine and we are always looking at more thing he is able to do with us as a family. This would be something everyone could do all 6 of the children and make Dallas feel like a big boy! Not only will it help Dallas have a fun way to play with all of the children it will also work his legs and his arms helping his CP. Just peeking in to remind you this giveaway is amazing...and we really, really want to win...really! I want to win because I live out in the middle of nowhere! Really. It's a 45 minute drive, just to get to the super market. There is absolutely nothing nearby for the kids to do. I have 4 kids at home, literally bouncing off the walls lol Winning would be so wonderful! I would love to win this because my children are mini Tiggers. It started with #1 and #2 has followed in suit. They bounce around the house all day long. You would think that they would get tired from all that jumping, but I haven't had luck with that yet. My littlest one #3 is barely starting to walk and already she will watch them and sit on her knees and bounce. I have a very loud and bouncy house! It would be nice to have a good outlet for that. Plus, slip and slides rock! My sister has 5 boys, the oldest is 5. All single births. Add that to my 4, and we have a house full this summer. Her husband is in the military and will be gone the whole summer. She is spending it with me. I am excited, but I also tend other kids during the summer, since I am blessed to be a stay at home mom. This means, on average, there will be at least 12 kids at my house at any given time. Of course, I live in a neighborhood with many young kids, so they too come to play in my backyard. This bounce house will afford me a little time to do what I love, write. What do you get when you put four kids in a house, add five more boys, who's father is in the military and gone for the summer, and the oldest of the five boys is five? Two moms who need a bounce house! My sister and her five boys will be staying with me and my four kids while their dad is gone. And oh what a full house that will be. Then add to the nine, neighbors and those I babysit, (I'm lucky enough to be a stay at home mom) and we have on average, twelve kids here at all times. So help keep these two moms sane. The month is quickly ending...this giveaway rocks!